The Old County Ground featured in two highly acclaimed cricket books by Stephen Chalke: 'Runs in the Memory - County Cricket' in the 1950s and 'Caught in the Memory - County Cricket' in the 1960s. 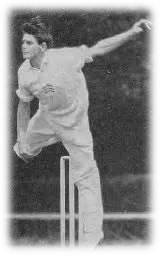 Dickie Dodds, the Essex opening bat, recalled a game against Lancashire in June 1952 which was tied in the last over. The Brentwood ground was described as the loveliest of Essex's many venues. There are trees on three sides of the ground and by late June there are splashes of red among the various greens of the oaks, elms and planes. Lancs. batted first and were bowled out for 266. Essex replied with 261. Lancs. declared their 2nd innings on 226 for 7 setting Essex 232 to win. With 3 balls left and one wicket remaining Essex needed one run to win. Trevor Bailey - for reasons best known to himself - tried to hit a six to win the game and was caught on the boundary. "I don't know why he did it", Dickie Dodds said, "I'd never seen him hit a straight six before.....". Stephen Chalke in his book explained that for once in his life Trevor was speechless. Robin Hobbs, the Essex and England legspinner, recounts a game at Brentwood versus Worcestershire in May 1965. He thought Brentwood was a lovely place to play ...... so peaceful. Essex batted first and made 302 all out. Trevor Bailey scored 74 and another Westcliff man, John Wilcox, 87. Worcester were bowled out for 135 with Robin taking 5 for 46. Essex declared their 2nd innings on 170 for 6 with another England man, Barry Knight, scoring 53 not out. Worcester were set an improbable 338 to win on a pitch taking an increasing amount of spin. Basil D'Olivera proceeded to play one of the great innings - 163 out of a total of 289. Essex won by 48 runs in the last half hour of the game. Robin Hobbs recalls, "As a game of cricket it had the lot. Dare I say it .... reasonable leg break bowling, fine swing bowling ..... a magnificent innings by D'Olivera. The sun shone .... A very good county match. It's always stood in the memory". Robin Hobbs (Hutton, Essex & England).